Dr. Karvounis is Invisalign certified and has completed a multitude of orthodontic cases. She has a particular interest in esthetic dentistry and she is a member of the American Academy of Cosmetic Dentistry. 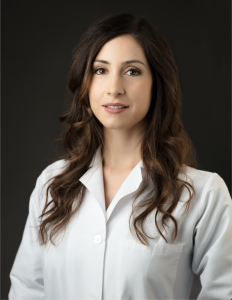 Additionally, she is trained in safely removing amalgam fillings and is a member of the International Academy of Oral Medicine and Toxicology. Away from work, Dr. Karvounis enjoys reading books about health and biology, practicing yoga, and social dancing, such as ballroom, Latin and swing.